Enrich your experience at our resorts using your smart phone’s GPS and our new beacon technology! Pinpoint your exact location within our resort and let the app guide you with step-by-step directions and a map to your breakfast meeting, general session, dinner with friends, a nightcap, or even your hotel room. Plus, you can opt-in to receive proximity-based notifications for special offers throughout the resort during your visit. 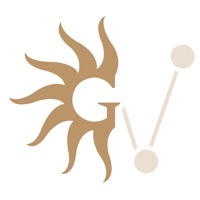 This application uses Gimbal beacon technology to update your location via GPS. Continued use of GPS running in the background can dramatically decrease battery life. The Bluetooth/location does not work for this app. I tried deleting the app and reinstalling it. It worked for one trip. Although the directions it have where completely off so the only benefit was that one time it knew where I was. This app is honestly pointless and I will now delete it and go old school and follow the confusing signs and ask around. To bad, its such an amazing place, huge, beautiful. But you get lost regularly. Hopefully the creators of this application are paying attention to the reviews and fix it. This app must have been developed by high school kids on a bad day. It’s terrible. Use the paper maps in the hotel and you’ll be much better guided. Such a nice expensive resort for such a crappy app. Tried to use this app at Opryland. It would never connect to Bluetooth so it never knew where I was in the hotel to tell me how to get around. Worthless would be an improvement. This app is not even half baked. The navigation function sends you to the wrong place. I get that it's a new hotel, but when we checked in we were given a map directing us to download the app. Disappointed since this place is massive. I initially though this app was a complete waste of space. However, when I disconnected from the Gaylord Opryland WiFi, and therefore from the VPN which I have autoconnect when I join potentially hostile networks, the app started working. Requiring that you leave your device in a vulnerable state is unacceptable for an app provider. 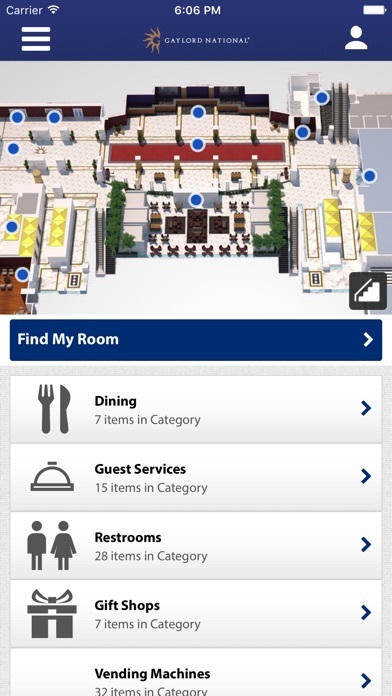 Literally downloaded the app INSIDE of Gaylord Palms and it could not locate me and go any further for me to be guided anywhere within the convention center. Need to do better than that. On the default page the text takes up so much room navigation is impossible. May work better on a considerably larger iPhone. Beacons seldom found in the Opry hotel at any rate. The map is a tiny bit helpful but not as well landmarked landmarked as it should be (and this is a way to get it into full screen at least) Overall with some work it could be really useful and as is isn’t a lot of help, at least on an iPhone SE screen. You would think for the money that this resort charges that they could afford to pay for a decent developer. The app didn’t even work on my device, it kept trying to find my location and could not and then would not allow me to manually select one. This app should be taken off of the App Store immediately until it’s ready for prime time. 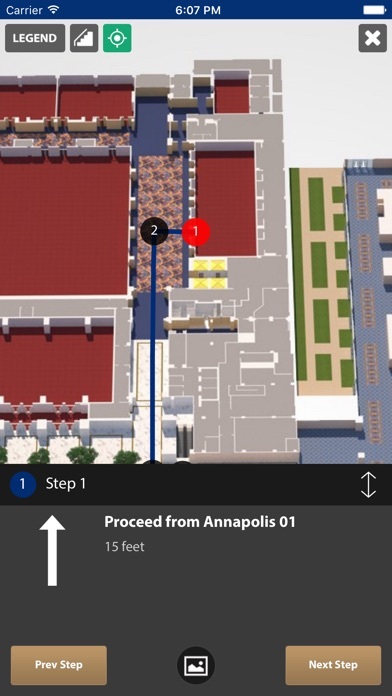 App could not locate my room, because the resource map of the hotel is inaccurate. Quite a few rooms are not depicted, especially in the corners of the hotel, and some room numbers are assigned to more than one room on the map. App also freezes during meeting room location. Bizarre warnings about Bluetooth not being enabled. App size is too bloated. Useless app. I deleted it about 2 hrs after I installed it. A confusing hotel to get around... make the app not confusing! Probably the worst way to provide directions that I’ve seen - why can’t you just provide an overview, and OFFER to take me step by step, turn by turn? And for that matter, I said the app could use my location... why wouldn’t you offer “current location” as the default starting location!? This app doesn't work at all. Every feature exposes at least one bug. Couln't make navigation around hotel work at all, it is not even able to show path from one place to another, after it failed to find me and my room. Description of individual places lacks info about where they are located, except for the almost useless "map view". This app is worthless. Whoever designed it should be fired or not paid. On a scale of 5 stars I would give it a minus 5. I was expecting this to work similar to the Maps app on my iPhone, to use GPS as I walked to show me where to go. Instead it had instructions you could jump ahead to so I never was really sure which step I was on (and a Gaylord already feels like you’re trying to navigate a hospital or airport, so I constantly felt a little lost). Could use some additional thought on how to best help the guest navigate easier. This app is useless. It should be designed to operate like a GPS system so that as you walk the screen moves with your location. However, it is designed to need manual operation where you walk 25ft and hit “next step” and then your next move comes on the screen. The idea of the app is genius and much needed but the engineering needs A LOT of work! Gaylord Opryland is a massive and beautiful resort. The idea of this app is great. I just wish it worked. Do yourself a favor....pick up a map and do it the old fashioned way! But getting lost here isn’t such a bad thing. There is always something awesome to see...particularly in the atrium. Don't bother coming here. Everything is massive gouging prices. Unbelievable. Not just slightly high, everything is double what youd spend at high end places. I always get lost at any Gaylord I'm at - navigation is not my strongest point. This is truly a huge help! Love it. 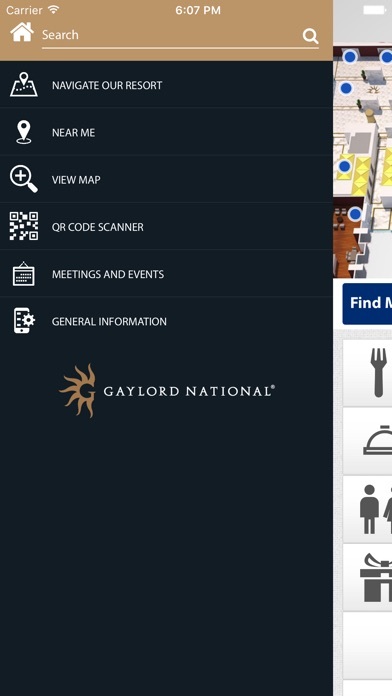 Gaylord hotels are very large so having an app to find your way around is a fantastic idea-if only this app worked. App just constantly cycled when trying to use the find your room function. Never did connect. Great to have on vacation. The kids loved using the app too especially when we would need to get back to our room after swimming or activities. Installed at check in and used it to review information about the hotel that replaced the need to use the printed materials in the room. My kids always say those are gross anyway just like the tv remote but gaylord hotels are always so nice and clean and we love how high tech they are now with the app! Good tool. Used at national to get me to meetings on time this week. Directions were perfect. This app is super convenient to have and makes navigating the hotel a breeze! I found this app very confusing to use. It would send me up the stairs and then down, when I could've just stayed on the floor and taken a left. Just not all that impressed. Made navigating in the resort no easier , in my opinion, and there are maps everywhere. Put phone down and just walk to enjoy the scene. Pros: finding my way around the hotel has been much easier (DC area one) Cons: A bunch of room numbers are missing which defeats the purpose of the room finder, current location finding times out, the event calendar isn't up-to-date. How is anyone supposed to use this app? It requires a security code to open. Staying at the Gaylord Opryland and this would have been useful. It will not let you access the app without a security code but offers no help on how to obtain the code. Couldn't get it to work. Crashes. Installed twice. Restarted iPhone. Not compatible with iOS 10. Was able to actually find my room. Good idea. Downloaded app. Recognized Gaylord hotel I am at. Asked for security code. WHAT security code???? WORTHLESS APP. Point A to point B. Good app thanks. Misleading! Even though it says "navigate our resorts", this app is only for Baltimore Property. When it comes to staying on any Gaylord property these days you will quickly hit your daily Fitbit goal of 10,000 steps. With that being said, YES, they're easy places to get lost, confused, frustrated, and arrive late to a meetings. This app can help you solve all of those problems with its easy to navigate platform that gets you from point A to Point B! Yes you might still have to walk 8-10 minutes from your hotel room to meeting space, but now you can do it with confidence! Love the app and where these hotels are headed! Love this app! The intimidation of such a large venue and being in a new place fades away. I'm able to navigate from place to place without having to ask directions around every corner, get ideas of where to spend my downtime, and still have all the information I could possibly want to know right at my fingertips. Thanks for this!